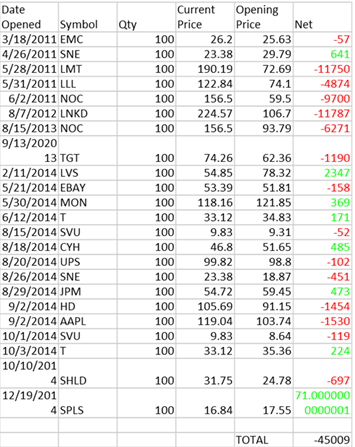 As mentioned on the #DtSR podcast I have been covering a simulated portfolio of hacked stocks. The strategy is to assume all companies that get hacked will go out of business because customers will go elsewhere. We short sell 100 shares into the close on the day news breaks. As you can see doing so would net you around -$45,000. Notice the big winners, Lockheed-Martin, and LinkedIn, who have more than doubled since they had a breach. That’s over half the portfolio. Diversifying into other hacked stocks didn’t help much either. On the bright side Sony continues to be a winner, no PolarVortex required.